Alvarez is one of the leading guitar brands in the world. It has been in the business since 1965 and it has no signs of slowing down so far. Joining the ranks of their eclectic inventory is the full-sized Alvarez AD60 acoustic guitar, a true masterpiece made for every player across the board. But will it fit you? Let’s find out. The Alvarez AD60 is second to none when it comes to durability. 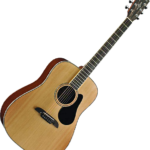 It has a solid spruce top made from quarter-sawn wood, a true guarantee that it is built with quality in mind. The back, neck, and sides are made of mahogany, while the bridge and fretboard are made of rosewood. It’s a popular guitar among beginners because it’s a guitar that costs less than $300. 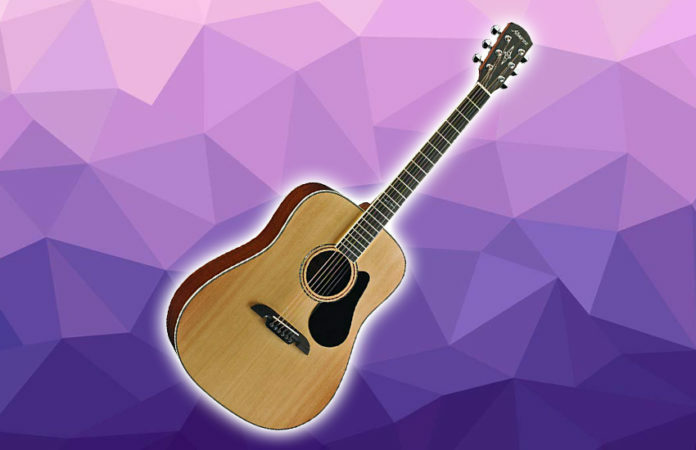 While a solid top soundboard is important for intonation and sound projection, there are other things to think of to pull off a high-quality acoustic guitar. It has a premium die-cast tuning heads, real bone for the nut and saddle, and ABS body binding. It also has FST2 bracing to support the top and the way it sounds. It supports the pinless bridge with a split saddle. The sound is loud and crisp. The trebles are perfectly in tune to not overwhelm the bass. That makes the sound accurately balanced. Thanks to the working components of the guitar as well. The Alvarez AD60 has a bi-level bridge responsible for the downward pressure that is stressing on the saddle, which is compensated with extra tension through an angled headstock. How much does the Alvarez AD60 cost? Not much at just $300. Truth be told, at this price range, it’s hard to find acoustic guitars that can throw off the Alvarez AD60’s superiority. From the details to customization, any user will be very happy to take hold of this instrument. Even owners of the guitar have been very happy about their purchase, with particular praises mostly for the aesthetics, sound, and build quality. If you would want to see some personal tweaks, the guitar is customizable to make it in tune with your playing habits and comfort. But fresh off the box, it should be fine. However, like any other guitars in this price range, you cannot expect to have any accessories out of the box. So, if this is your first time buying an acoustic guitar, you might have to shell out more for the necessary accessories for you to fully enjoy this beast and learn or improve the skills you want to. The Verdict: Should You Buy Alvarez AD60? Absolutely! The Alvarez AD60 guitar is a top-grade guitar perfect for every type of player. 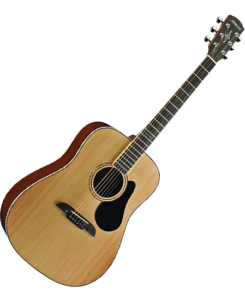 If you are a beginner player and you have extra cash to spare, the Alvarez AD60 acoustic is one of the best options out there, if not the best. If you are a pro player, it’s an affordable option that will leave a mark on you.